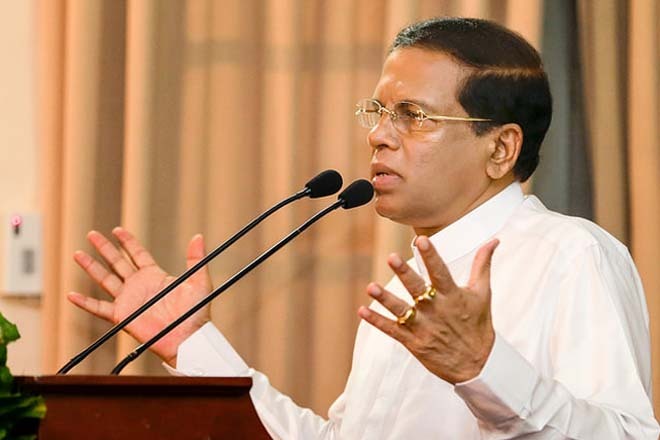 Apr 19, 2016 (LBO) – Sri Lanka’s President Maithripala Sirisena, in a public address on Monday, said he would not support tax increases that burden the people. The Value Added Tax (VAT) rate is scheduled to be increased to 15 percent from May 2nd, according to the Finance Ministry, and will include the telecommunications sector. The new government is people friendly, Sirisena pointed out, speaking to a gathering in Polonnaruwa. Sri Lanka is currently in talks with the IMF for a 36-month facility of at least one billion dollars to support the island’s foreign reserves. During these discussions the IMF has rightly pointed out that fiscal consolidation is necesssary. State Minister of National Poicies and Economic Affairs Niroshan Perera told reporters on Monday that the plan to increase the VAT rate was not due to pressure by the IMF. “There is no IMF pressure, Sri Lanka makes decisions as a sovereign nation,” he said. “If there is a challenge we must take steps to address it. Our debt burden is higher than expected, and that is why this decision is being taken,” he added.